As children my sister and I loved scary movies. We watched all of them, probably much younger than kids were allowed. We also enjoyed all of the movies with Superheros and the classic, original monsters. Our father being an English Teacher had such a creative mind. Though we enjoyed the movies we of course would still be a little scared to sleep some nights. Instead of opening a book and reading page to page to us, my sister and I would hop onto one of the beds and my dad would begin telling a story off the top of his head. They always included a scary character like Freddy Krueger (as an example)... and then Batman would join the story and put Freddy in prison. Sometimes, the scary characters would end up turning good and befriending Superman or the Beast from the TV Series Beauty and the Beast. Each night he would tell us stories, the characters were new and the story lines were so exciting and suspenseful. We would still read books of course. We had many, many books in our house, especially the entire collection of '..Little Golden Books' which were always our favorites. Once I could truly read and my little speech setback was corrected in which I could pronounce all of the letters in the alphabet I really enjoyed making up voices. I did it mainly to make my sister laugh as well my parents and friends. I liked to pick out books to read that had a lot of conversation going back and forth between the characters. 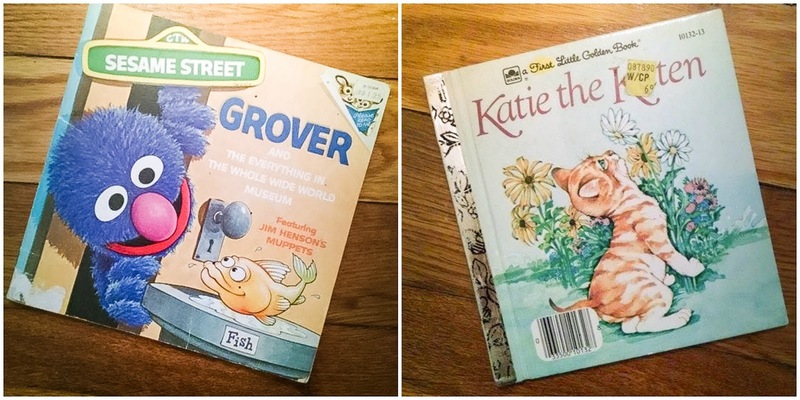 Charlie and I decided to each search for a book that we loved as children. Amazon is an amazing thing! I of course loved Katie the Kitten because my name was printed on every page. Charlie was a big fan of Grover and as we went through the books together we attempted to talk in the Grover voice. We cracked up and couldn't get through an entire page reading in his voice. I look forward to reading these stories with Autumn and having her discover someday her favorite book she loved as a child. #86: Sharing stories together as a family each day and talking in silly voices.